The Rhode Island writer H.P. Lovecraft (1890-1937) has long been considered a master of weird and horror fiction; but academic critics have shied away from his work, both because they have not felt that horror fiction is serious literature and because Lovecraft published much of his work in the lowly “pulp” magazines of the 1920s and 1930s. But now a new generation of scholars is reassessing Lovecraft’s wide learning, his serious approach to writing, and the many levels of meaning that his work reveals. This book, compiled for the centennial of Lovecraft’s birth, contains thirteen original essays by the leading American scholars on Lovecraft. A wide variety of critical approaches—biographical, thematic, formalist, comparative, history of ideas, genre study—is used to display the breadth and riches of Lovecraft’s novels and stories. Three biographical essays supply startling new facts and interpretations of Lovecraft’s life and literary career, embodying much original research. Kenneth W. Faig, Jr.’s essay on Lovecraft’s parents and Jason Eckhardt’s essay on Lovecraft’s New England heritage supply important background information on his work. Will Murray supplies a radical new interpretation of Lovecraft’s relations to the pulp magazines. A series of thematic essays explores Lovecraft’s work from differing perspectives. In an overview, Donald R. Burleson finds five dominant themes in his fiction, all related the the fundamental notion of humanity’s insignificance in the vastness of an indifferent universe—what Lovecraft himself termed “cosmicism.” Peter Cannon, Stefan Dziemianowicz, Steven J. Mariconda, David E. Schultz, and Robert H. Waugh discuss various aspects of Lovecraft’s style, imagery, and narrative method, showing both the richness and the interconnectedness of his work. The four final essays deal with comparative and genre studies. Robert M. Price treats of Lovecraft’s myth cycle and of how later writers and critics have misinterpreted this creation by failing to perceive Lovecraft’s atheistic and amoralistic philosophy. R. Boerem, Norman R. Gayford, and Barton Levi St. Armand probe Lovecraft’s relationship to the horror fiction tradition, to literary modernism, and to the fictive universe of Jorge Luis Borges. The book concludes with an extensive annotated bibliography supplying information on the best editions of Lovecraft’s work and the best scholarship devoted to him over the last five or six decades. In sum, it is hoped that this book will both clear away many of the misconceptions surrounding Lovecraft’s life, work, and reputation, and suggest directions for future study. On the centennial of his birth, Lovecraft finally appears to be gaining the academic and general recognition that eluded him in life. The Lovecraft Revisionists, by R.D. Mullen. 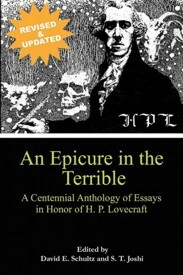 An Epicure in the Terrible: A Centennial Anthology of Essays in Honor of H.P. Lovecraft. Edited by David E. Schultz and S.T. Joshi. Rutherford, NJ: Fairleigh Dickinson University Press; 1991; ISBN 0-8386-3415-X (hardcover). New York, NY: Hippocampus Press; 2011; ISBN 978-0-9846386-1-1 (paperback).